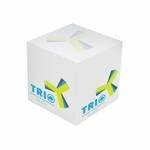 Promotional Paper Blocks are a great way to keep your brand and company on a client’s desktop in a truely functional and useful product. 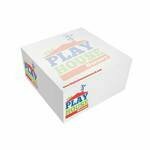 We have an extensive range of promotional paper blocks and can offer a number of print options including sides and top covers as well as every sheet of paper within the paper block. 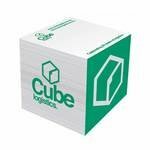 Pallet paper blocks are a popular choice as are ones with holes drilled into them into which to place a branded promotional pen. Once your clients use a paper block they often then always want a replacement one when they run out giving you the chance to make contact and ensure your paper block is the one they have on their desktop. 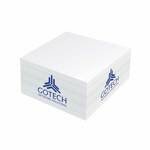 Promotional block-mates are a fun item to present to customers and clients, and to use within the home and work place. 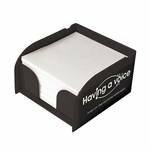 They are the perfect item for adding your imprinted message to, either on the top, sides, or both to jazz up your marketing campaign. The branding area for these items is limitless. Imprint on the top of the papers in the block to keep your message visible for the life of the block. When your client needs a piece of paper to jot down some important information, your branded block-mate will be at an arm’s length reach on their desk. Quantity of sheets in each block will vary according to block height, but many are 750 to 1000 pages deep. 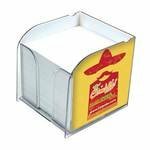 It is a novel and very fun way to get your advertising message into the public eye and keep it there, for paper on the desk is one of the most useful items going don’t you agree. 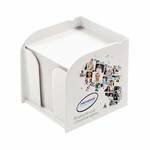 Promotional memo blocks are always in demand, and people will grab one if they have a chance, the perfect way to get your brand in front of the client to make that lasting impression. There is a huge benefit to paper block-mates. You can target every age group with these and you can get exposure on a regular basis that you can’t get with just any promotional product. Why would you want to pass that up when you can get this kind of advertisement for such a small cost? A paper blocks collection can be used in a home, office, or even a student’s desk. This means that you are not limited by any kind of narrow target audience. 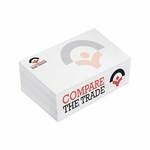 Grab yours for your company today and make your marketing count. 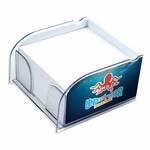 Can you supply custom or bespoke shaped paper blocks? We can supply a custom shape using a cutter made to our specifications. 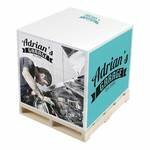 The unit cost for a custom or bespoke designed paper block will always be higher than for a standard product but could more closely match your marketing campaign requirements. 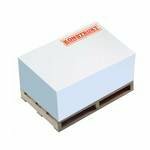 Where can you print on a paper block? 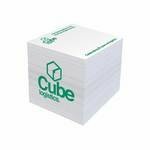 For most of the paper blocks we supply we can print onto the top sheet, each individual sheets and the block sides. The number of print positions and colours dictates the final unit cost. Can you drill a pen holder into a paper block? 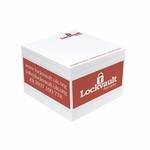 Yes, and we can also supply a matching promotional pen to fit and bundle with the paper block.